If you run, you probably get basted with options for Turkey Day trots. Many cities, community groups and schools conduct some sort of 5 or 10k family jaunt either on Thanksgiving itself or this weekend. I even found a few marathons offered as pre-turkey activities. For those not traveling near and far, the turkey runs offer a nice start to a day of sitting around watching football (or better yet playing Skylanders or Call of Duty) and then gorging on stuffing and pumpkin pie. I call it banking the calories as a way to alleviate any gluttonous tendencies. But for us, the runners of the world, we do not need an organized event to celebrate Thanksgiving and set up our bodies to absorb a massive meal. In recent years, I have found that picking my own special course is far more rewarding and engenders many more feelings of thanks. If you love those turkey trots, by all means, keep running them. But if you are bored with those and the logistics, cost and travel time associated with participating in a planned event, read on. The first key to your personal turkey day activity is to plan out how many miles you want to cover and how much time you have to cover them. For me, I use this day as my long run of the week. Why? Well, other than a date with football, I have hours before I need to show up at the family feast. And since I can DVR the early pigskin game (9:30 out here on the West Coast), I don't even bother to set a morning alarm. I just get up as I may and then casually get ready and head out the door. Today I set my schedule for 15 miles and to be done, in total, with no more than three hours out of the house. Next, pick your destination. Here is where I recommend you take the opportunity to run someplace special. If you can, don't retread the same usual pavement. Explore. Drive somewhere new. Look up routes online or talk to friends. Get out of your comfort zone. Remember to take a map or a GPS enabled smartphone. 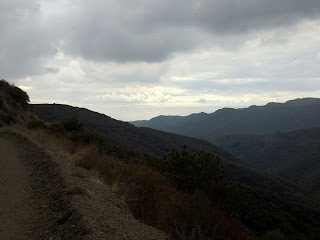 Today, I returned to the Santa Monica mountain trails. While not new for me, I rarely have time to drive to the trailhead and do a slow run (given the hills). So, I maybe make it up there every few months. Take a look at the picture to see why I love it. What's also nice about this type of trail is that you are rarely alone. When I started just after 8 am, I pretty much shared the road with a small number of mountain bikers. By the end, 2:15 later, families were walking their dogs and trotting out their stroller-bound kids. Everyone says hello or Happy Thanksgiving. And really, feeling the vibe of the day is the point. Sure, you are clocking the miles as you train for your next race or decompress from a stressful few weeks or just get in some fitness. But take a look around and see the new vistas. Appreciate the differences between your normal routine and your special personal special event. As I ran up and down in the hills, I loved seeing the green hills (watered by some heavy rains last weekend) and the distant views of the city. The sun darted behind clouds and then reappeared. The dirt-gravel surface felt new under my feet, and the miles clicked by. I put on 15 in 2:15 total time - about a 9 min pace or about 30 seconds per mile slower than normal. But who cares? It was my thanksgiving run to feel my own appreciation for the fact that I run and that it provides me such joy and pleasure. So, get out there this weekend and pick your spot. Run 1 mile or 10 or more. But as you do, remember that running is both natural to our bodies and somewhat alien to our current daily routines. And breaking up the routine is certainly something to be thankful for.